NEW YORK -- The Giants won the Super Bowl. 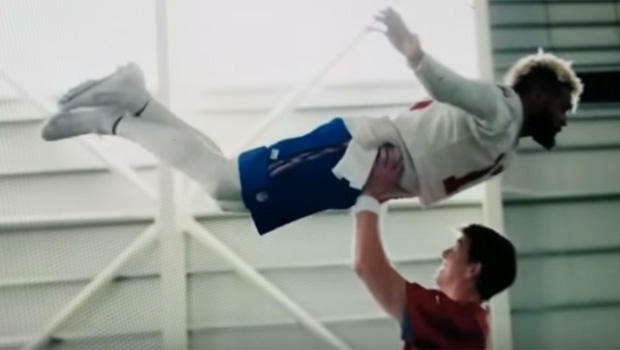 Not really, but Eli Manning and Odell Beckham Jr. stole the show with an NFL ad in which the two perform the choreography from the movie "Dirty Dancing" - complete with the iconic lift done by Patrick Swayze and Jennifer Grey. The third-quarter ad was an instant social media hit. Twitter users said they had the time of their life. Bret Werner, president of MWW public relations, said "the NFL spot on "Dirty Dancing" was vintage. The Odell and Eli connection scored off the field." This year's ads ran the gamut from tame humor to tame messages about social causes. Instead, Budweiser, as always the largest advertiser during the game, eschewed the usual puppies and Clydesdales to showcase employees that send water to places in need. Verizon showed people thanking first responders who saved them. And Tide tried to make people laugh (and perhaps forget about its Tide Pod problem) with a humorous series of ads that starred "Stranger Things'" actor David Harbour. "This is a year where people are feeling a little frayed around the edges because the divisive political environment on both sides," said Kelly O'Keefe, a professor at Virginia Commonwealth University's Brandcenter. "They want to feel like there's something still good in the world." While the Philadelphia Eagles bested the New England Patriots in a nailbiter on the field, advertisers were fighting a similar battle to win over the hearts and minds of viewers. It's the largest live stage for advertising all year, so advertisers brought their A-game. Tide took a novel approach with ads each quarter that poked fun at typical Super Bowl ads. Harbour popped up in familiar-looking ads that appear to be about different products: a car, an insurance company, jewelry and Old Spice (another P&G product). The twist? They're really all Tide ads, because there are no stains on anyone's clothing. Tame comedy like the Tide ad was a theme throughout the night. In a year that saw the #MeToo movement shine a spotlight on sexual harassment, the vast majority of ads sill starred men but there weren't any that focused on scantily-clad women or sexual innuendo, save for an awkwardly dancing - and fully dressed - woman in a Diet Coke ad. Comedian Keegan Michael-Key cut through complex jargon to put things plainly in a humorous ad for Rocket Mortgage by Quicken Loans. When a restaurant patron is confused by what a "beef-protein gluten-free pate" is, he explains: "It's a burrito, filled with plants pretending to be meat." An Amazon ad showcased different celebrities - including actress Rebel Wilson, actor Anthony Hopkins, singer Cardi B and chef Gordon Ramsay - filling in as the voice of Amazon's Alexa voice assistant. M&M's featured Danny DeVito as a human M&M. And Mountain Dew and Doritos staged an epic hip-hop lip sync battle between actors Morgan Freeman and Peter Dinklage. The two synced to Missy Elliott and Busta Rhymes, respectively. "There's a reason so many marketers are using celebrity combined with comedy - because it breaks through the clutter, delivers the message and gets buzz," said Aaron Shapiro, CEO of ad agency Huge. An ad for Blacture, rapper Pras' new media platform, was one of the few ads to make an overtly political statement. It showed an African-American man standing alone on stage with tape over his mouth and a blindfold on his eyes. "Blacture. Be celebrated. Not Tolerated," text on the screen read. And T-Mobile's ad showed babies and enlisted Kerry Washington for a voiceover that talked about equality. "The (T-Mobile) message is terrific but all the way through, if you asked consumers who the ad is for, nobody would know," said Kimberly Whitler, marketing professor at the University of Virginia. "There's a lot of research that says millennials really like it when brands link themselves to causes," said Taylor. "It's just refreshing for a lot of people to see these unifying types of messages by the advertiser." But advertisers can stumble in these efforts when the connection seems tenuous. There was some negative reaction when Fiat Chrysler's Ram trucks ad featured a speech by Martin Luther King, Jr. The commercial, timed to the 50th anniversary of the speech, showed people doing good deeds like giving out food to the needy and rescuing a boy from a fire. "Everyone seems to be moving into more comedy, quirky, unique (ideas), which my friends and I all are enjoying way more" than past years, Mann said. "I think we all need more laughter these days."